I was browsing through the Sheinside website the other day and I realized that all I want to wear right now is a cozy sweater. They have sooo many. A sweater for fall is such an effortless look. Put on some boots and jeans and you're done! I figured I'd do a little collage post of my favorite ones, especially since tunes-day tuesday this week is a song called "Sweater Weather". I love with this song and it was the first to make it on my fall playlist. It's just so fun! What are you listening to this fall? 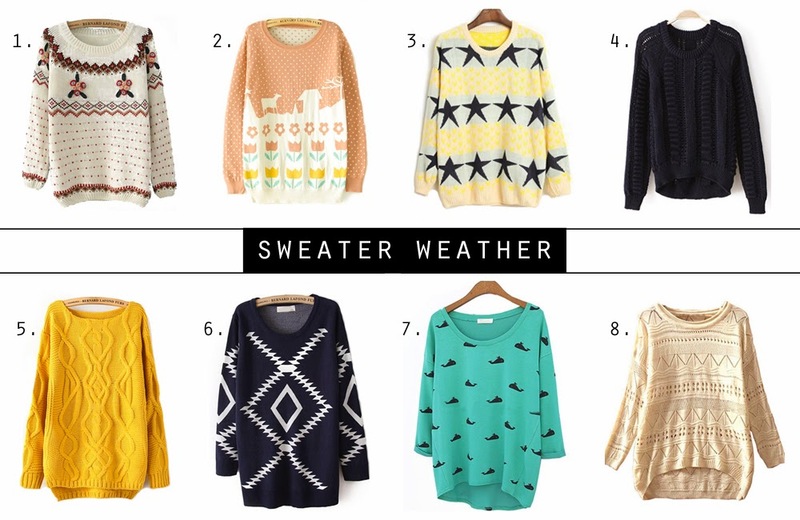 All the sweaters are so cute but 3,4, and 8 are my favorites! i hit the sweater jackpot in korea! loving sweaters right now! la chanson est géniale, j'aime beaucoup le clip!